If you need a heavy-duty pickup for work or for play, you can't go wrong with the Ram 3500. This popular heavy-duty pickup truck is efficient, powerful, and equipped with the towing technology you need. The 2018 Ram 3500 is available in multiple configurations, which ensures every driver can customize their new pickup to their needs. If drivers select the Max Tow Package, their Ram 3500 will come with upgraded rear air suspension, a fifth-wheel prep, and a 30k hitch. When running on diesel, that hitch can haul as many as 31,210 pounds. Even if drivers opt for the standard configuration, they can haul up to 7,350 pounds in the truck bed and cabin. 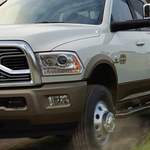 Drivers can experience the towing and hauling capacities of the Ram 3500 today. Come to Ross Motor Company soon to take one of these high-powered pickups out on a test drive.